Wedgwood Jasperware: A 10-Point Primer | Skinner Inc.
Wedgwood is ripe for collecting with examples manufactured in a variety of bodies, colors and subject matter over 260 years of production. To the novice, Wedgwood is often light blue jasper or perhaps a familiar dinner service from childhood. 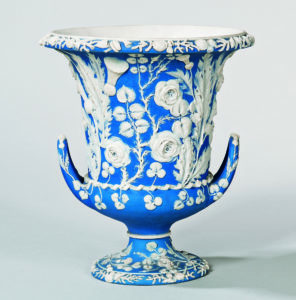 What they might not realize is the breadth of production or the fact that Wedgwood collectors span the globe. Follow these pointers to learn how to identify Wedgwood and what to look for in this collecting area. 1. Quality: Look for especially high relief with good undercutting and fine details. This factor is a crucial indicator. Use the pointers below to hone your knowledge and your eye. 2. Marks: 18th-century marks include an all lower case mark, a Wedgwood & Bentley mark, and an upper-lower case mark. 19th-century marks were pretty standard variations of all upper-case lettering, the second half of the century including a three letter date code in many cases. Late in the 19th century, ENGLAND and MADE IN ENGLAND were added and again with some variations. Much of the more “modern” Wedgwood Jasper produced from the 1950’s onward have the year impressed as well as the mark. 3. Texture: The surface of Jasperware produced in the 18th century is silky smooth to the touch. As time went by that smoothness became more granular with 20th-century examples feeling quite rough by comparison. 4. Color: Specific colors were produced during certain periods; even with the trademark blue there are so many variations in tone that help in determining age. 5. Literature: There are a tremendous number of books on the subject, most with excellent photos. Visit your local library or bookseller. 6. 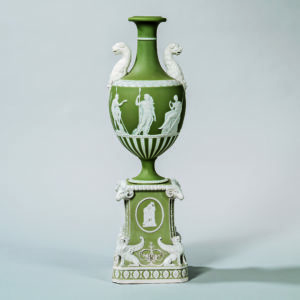 Museums: While many major US museums display wonderful examples of Wedgwood, the largest and most comprehensive collection of Wedgwood ceramics outside of England is housed at the Birmingham Museum of Art in Alabama. 7. Auctions: Previews allow you to not only see fine examples in person but also handle them and speak to the specialist about them. 8. Wedgwood groups: Regionally in the US there are the Wedgwood Societies of Boston and Washington, D.C. There is also the Wedgwood International Seminar which is in a different US city each year. The lectures and the camaraderie that comes with participating in these groups is top notch. 9. Internet: Wedgwood discussion groups on Facebook and the like where you can see what others post, ask questions and see the variety of wares collected. 10. Collect: Interesting examples can be found for any budget and the breadth of styles produced mean Wedgwood can fit into any decor. All in all, Wedgwood is a most enjoyable and decorative category of collecting. 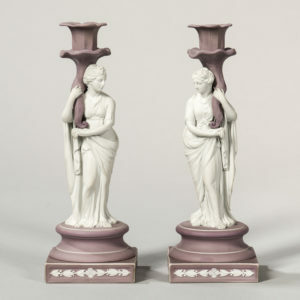 This entry was posted in Blog and tagged british ceramics, British decorative arts, British porcelain, British pottery, English ceramics, English porcelain, English pottery, European decorative arts, quality wedgwood, Wedgewood, wedgwood auctions, wedgwood jasper, wedgwood wares by Stuart Slavid. Bookmark the permalink.